We’ve finally released Notepad.net to the Windows App Store. 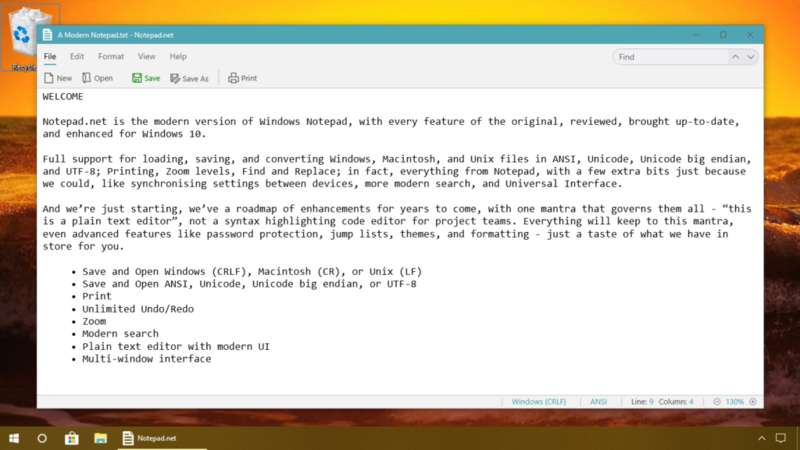 Notepad is the modern version of Windows Notepad, with every feature of the original, reviewed, brought up-to-date, and enhanced for Windows 10. Full support for loading, saving, and converting Windows, Macintosh, and Unix files in ANSI, Unicode, Unicode big endian, and UTF-8; Printing, Zoom levels, Find and Replace; in fact, everything from the Microsoft Notepad app, with a few extra bits just because we could, like synchronizing settings between devices, more modern search, and a Universal Interface. And we’re just starting, we’ve a roadmap of enhancements for years to come, with one mantra that governs them all – “this is a plain text editor”, not a syntax highlighting code editor for project teams. Everything will keep to this mantra, even advanced features like password protection, jump lists, themes, and formatting – just a taste of what we have in store for you.